AAA members will enjoy a night just for them at discount prices during the tenth annual Six Flags Magic Mountain AAA Member Exclusive Night on Friday, May 10. By pre-purchasing tickets online at AAA.com/SixFlags, members can spend all day May 10 at the park and then stay for the private AAA event taking place from 6 p.m. to midnight after the park closes to the public. AAA member ticket prices for the event are $41 per person for park admission (a savings of 49 percent off the regular gate price) from 10:30 a.m. to midnight on May 10, and $54 per person for park admission plus an all-you-can-eat buffet dinner taking place from 7 p.m. to 9 p.m. Parking is free after 5 p.m. (a $25 value). Online processing fees will apply. The all-you-can-eat buffet includes chili cheese dogs, chicken strips with barbecue sauce, baked beans, corn, tossed green salad, potato chips, rolls, Popsicles, cookies and cream ice cream bars and unlimited Coke product soft drinks. The park is located off Interstate 5 at 26101 Magic Mountain Parkway. 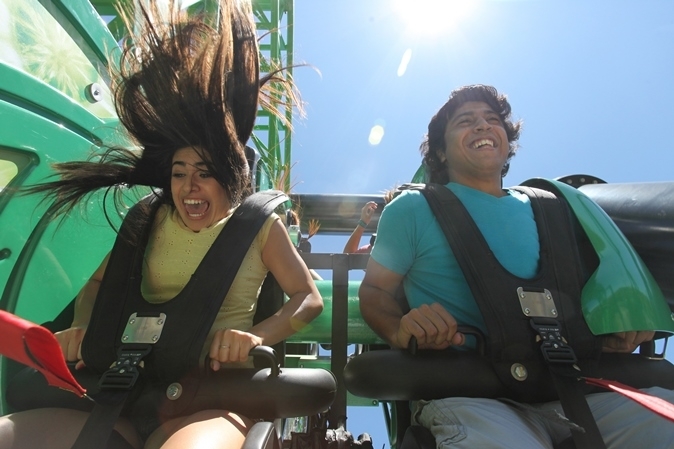 Auto Club members can buy discounted Six Flags tickets for any day of the year at AAA.com/SixFlags. A one-day discounted admission to Six Flags Magic Mountain is $57 for AAA members pre-paying online (plus online processing fees) – a 28 percent discount off the front gate ticket price. AAA members can also show their card at the front gate to get $5 off the Six Flags Magic Mountain general admission price of $89.99. In addition to the ticket discounts, Auto Club members can save 10 percent off merchandise purchases of $15 or more at selected stores inside any Six Flags park.